Cuisinicity Tip: I actually prefer to mix the dough by hand in the exact same order as I describe below rather than with a food processor because this crust is best when handled as little as possible. The only difference with doing it by hand is that it will come together at the very end, when you gently gather the dough with your hands into a ball--you'll see! However, if you are in a hurry, the instructions I give below also work well but make sure NOT to over beat--a couple seconds is all you need with each pulse, REALLY! I also do NOT refrigerate the dough as is typically done because I find that it rolls perfectly with this little technique: Place the dough between 2 10" plastic ziploc bags and apply gentle pressure on your rolling pin: you'll have NO trouble rolling it into a nice smooth circle and it won't come undone when you transfer it to a baking sheet. Note that I clean and reuse the plastic bags so it's not wasteful! Sift the flour and confectioner sugar and place into the bowl of a food processor (but you can make it by hand if you prefer-see cuisinicity tip). Add the vanilla and smart balance and pulse a few times for 8-10 seconds each until crumbly. Add one egg yolk at a time, each time pulsing for a few seconds. Do not over beat! (see my tip above)until the dough just barely starts to come together (you'll form it into a ball when you take it out in the next step). Gently take out the dough and form into a ball. Wrap in cellophane and set aside until ready to assemble. Place 1 Tbsp smart balance in a microwavable little bowl and cook in the microwave oven on high for 2-3 seconds. Add applesauce, almond meal and egg and stir well with a spoon until thoroughly mixed. Peel off the top plastic bag layer, then turn dough over and transfer onto a 9 inch pie dish. Peel off top plastic layer. Spread the filling evenly on top of the dough. Place the sliced apples, side by side in one layer, like a pinwheel to make a beautiful display (see the photo). Mix the sugar and cinnamon together and sprinkle on top of the apples. 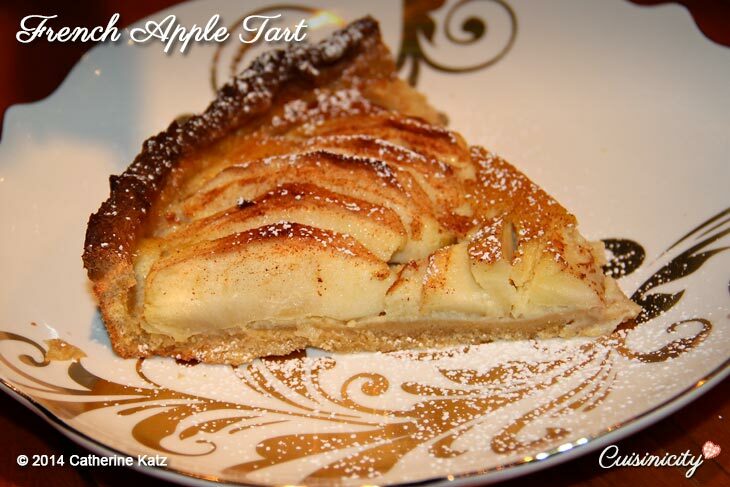 Bake in preheated oven for 30-40 minutes or until the apples are tender and golden. Please tell me what Smart balance is. There are many other spreads like it you can use, just make sure that they contain no transfat or saturated fat. I just happen to like smart balance because of its texture and taste and how it “behaves” in my pastry dough. I hope this is helpful! I will follow the link and see what we have in South Africa! WOOOW Marie…. all the way from South Africa!! I am honored! Have you tried this with a 9″ tart pan? 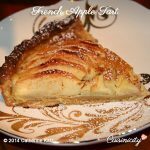 My wife made the French Apple Tart today. For starters, it looked just like the image above and more important, it tasted incredible. Not being big ‘almond flavor’ fans we were unsure what to expect. The combination of flavors of vanilla and almond meal with apple sauce & apples all worked really well together! This is the type of dessert I would expect at a better restaurant. Thanks for a terrific recipe. By the way, the dessert never made it to dinner. WOW!I LOVE it!!! Really, this is one of those comments that just makes me so happy, and I thank you for it! You have such a GORGEOUS website!! I’ve spent far too long here as it is. I need to pace myself..LOL. Your recipes are so beautiful, and yet not too difficult for home cooks. Do you have a cookbook, or would you consider a cookbook? The pictures of each recipe is a feast for the eyes. Thank you. THANK YOU Joella!! What a lovely thing to say!! I don’t have a cookbook, and perhaps will consider one in the future but for now I am just happy to share with everyone! Comment like yours makes it all worthwhile! Hi Jennifer, it does indeed! Whole wheat pastry flour has about 4 g fiber per 110 calories which is comparable to the fiber content of whole wheat flour. Enjoy!! This looks great! I’ve been looking for some healthier alternatives when getting together to bake with my Pie Gals. The one time I used whole wheat flour, it was impossible to roll, but the whole wheat pastry flour was recommended to me. Do you know if it has the same fiber content as the regularly milled whole wheat? Yes, it works great. You aren’t that far from Canada – perhaps you could request that your store carries it? No I haven’t and I looked for it everywhere too! I think, because it’s originally from Canada so they don’t sell it in my neck of the woods. Bummer! Did it work well for you with the baking too? YUM – going to try this on the weekend – did you ever find the canola harvest? I really like it! No I haven’t! I think you are going to love making this crust because you can make it by hand, no need for mixers, and I know that’s how you do this in the Greg household!